This is a recipe that was suggested by my wife after having a similar dish at one of our favorite restaurants. 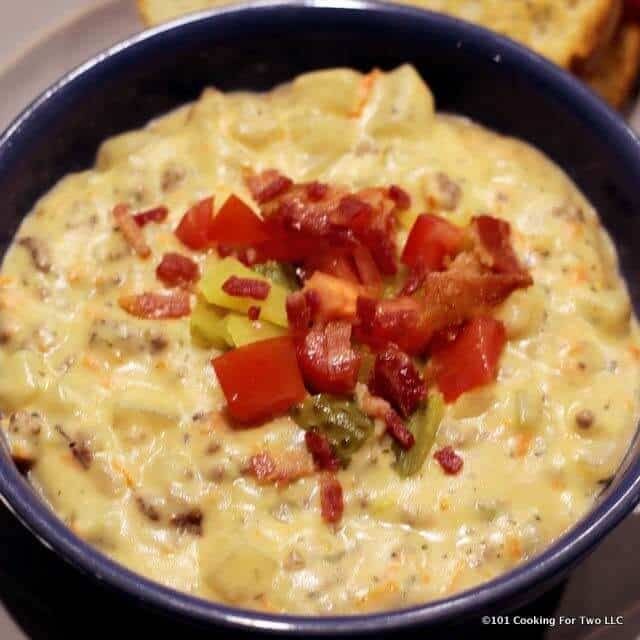 Think of it as an extra thick cheesy potato soup with some burger. I am calling this an extra thick soup, but it can also be called a chowder which is a thick soup based on a white sauce. 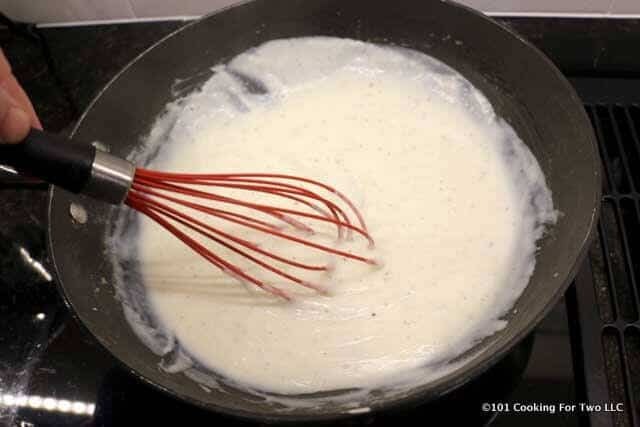 A white sauce is based on a roux with flour which it the thickening method of this recipe. A lower 5 or high 4. I was hungry and loved a thick cheese soup, so I’m going with the 5. 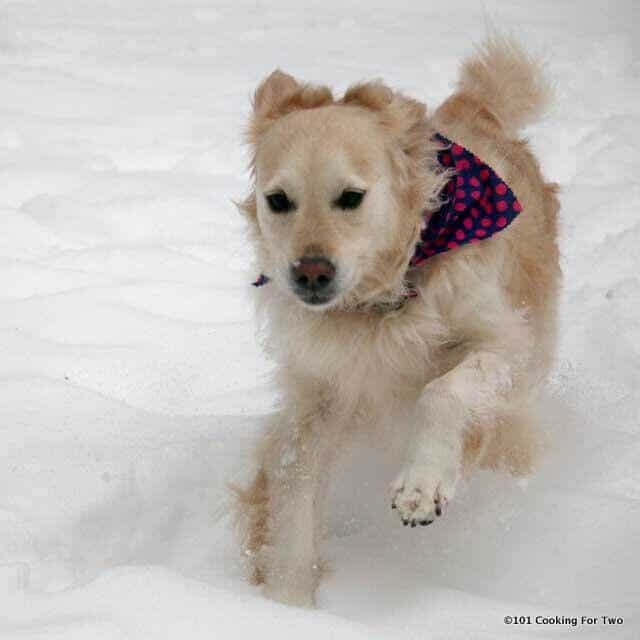 The model recipe I settled on was a Taste of Home recipe that was stovetop. It was not exactly what we wanted. I wanted the crock pot. Plus I wanted some other adjustments. 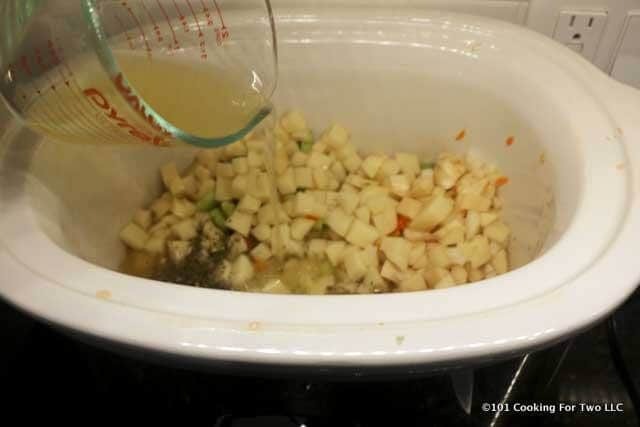 The big change was the thickness of the soup along with the crock pot conversion. I doubled the thickening and made exactly what we wanted. That was done by doubling the roux (butter and flour). I knocked the potato down a bit. There was more potato than want we wanted. Also, be sure that the potato is chopped smaller than then other soups. I suggest 1/2 inch or a bit smaller. The burger is double the model but suggested by commenters, and an obvious must do. I consider the basil and parsley flakes optional. I did them but felt they didn’t add anything other than a hint of basil that didn’t seem needed. Thickening soup in the crock pot. 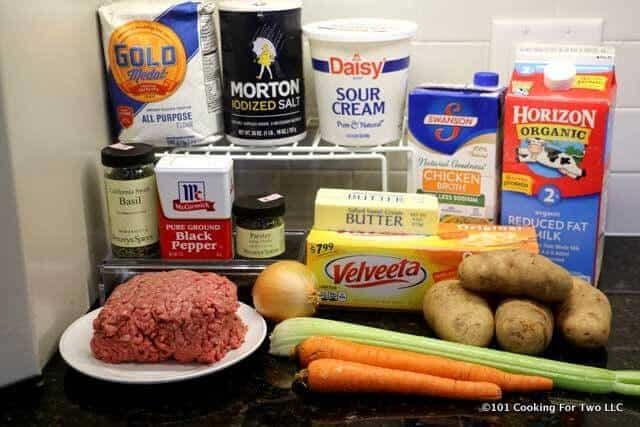 This recipe depends on a roux to thick the soup in the crock pot. A roux (pronounced roo) is the best way to thicken in a crock pot and almost any other liquid like gravy. Here we are using equal parts of butter and flour. Melt the butter and whisk in the flour and cook for a few minutes. Then we add some liquid (milk here) and allow it to thicken before adding to the crock pot. If you want a somewhat thinner more soup like result, the cut the butter and flour in half. You can also use tapioca, cornstarch, or arrowroot which are less fussy for thickening in a crockpot. What doesn’t do well is just added flour to the recipe. I do not like cornstarch here since reheating a liquid that has been thickened with cornstarch gives a gel-like consistency. I continued my love of Velveeta. It melts well, and I do love the taste. OK, I know that is not “gourmet or foodie” like but this is an everyday cooking blog. But any American or cheddar cheese should be fine. Or go wild and use the cheeses of your choice. This was relatively easy. There had to be a stovetop part of this recipe, and it needed to be near the end. So part one, cook the veggies in the broth. The broth was decreased a bit to make one even can. Part two, stovetop and everything else. The fluid from part one was made up in part two with milk to increase creaminess. Most of the ingredients set in your kitchen now. Peel and chop 3-4 medium potatoes into 1/2 inch cubes to make 3-4 cups. 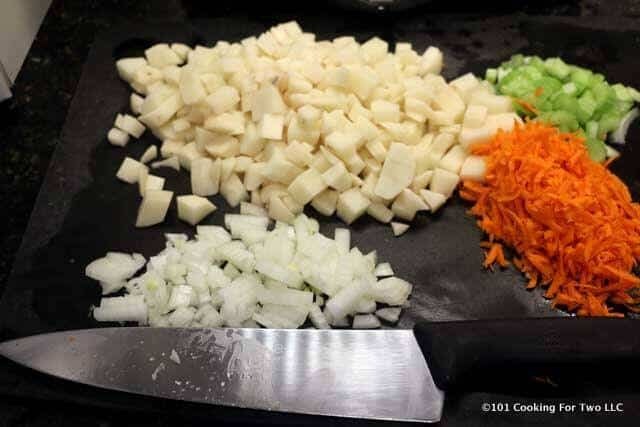 Peel and shred 2 medium carrots and chop one small onion and one stalk (rib) of celery. Add veggies to larger crock pot. Add 2 cups low sodium chicken broth. Optionally add one teaspoon dry parsley and 1 teaspoon basil. Cook on low for 4 hours. At 4 hours, brown 1 pound of ground beef. Drain the beef and add to the crock pot. Wipe out the pan. Melt one stick (8 tablespoons) butter. Add 1/2 cup flour, whisk for several minutes until changing color slightly. Add 2 1/2 cup milk. Whisk continuously for a few minutes while adding 1/4 cup of sour cream, 1/2 teaspoon salt and 1/2 teaspoon pepper. Add to crock pot and mix well. Add 1 pound cheese of choice. Velveeta for me. Cook one additional hour on HIGH. Top the way you would your cheeseburger. I love some bacon, tomato, and pickle. 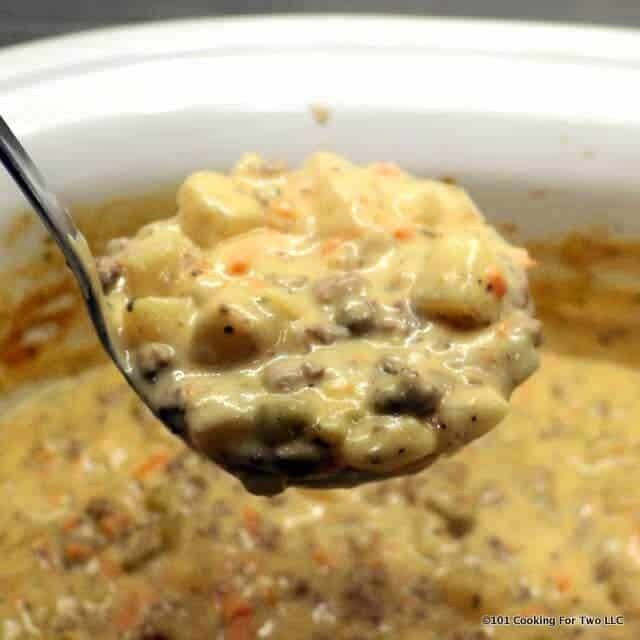 This is a great tasting extra thick Cheeseburger Soup that will become a great addition to your cold-weather rotation. 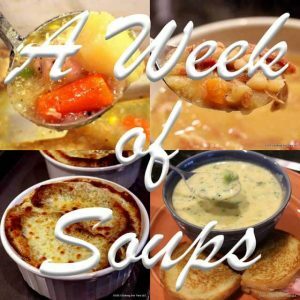 A "stick to your bones" type of soup. Wipe out pan. Melt one stick (8 tablespoons) butter. Add 1/2 cup flour, whisk for several minutes until changing color slightly. Add 2 1/2 cup milk. Whisk continuously for a few minutes while adding 1/4 cup of sour cream, 1/2 teaspoon salt and 1/2 teaspoon pepper. Top the way you would your cheeseburger. I love some bacon, tomato and pickle. As written, this needs a larger crock pot of 6 qt or more. A half recipe would fit in a 3 qt. crock pot. Use the cheese of your choice. This is good in the refigerator for 3-4 days and will freeze well for 3-4 months. If you want a somewhat thinner more soup like result, the cut the butter and flour in half. You can try arrow root for the thicken and whatever you normally for the dairy elements but I have my doubts about the outcome. Whenever you need to substitute of more than one thing, it gets dicey and you would be substituting for most of the soup. Just not a good idea. Hi, we are in the process of making this today. 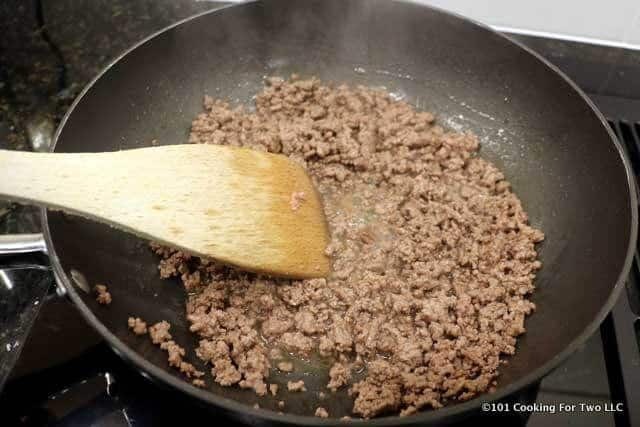 What would happen if I added the ground hamburger in the beginning with the veggies? I will be gone all day. Also, I don’t see the onion in the list of ingredients, does it matter what kind, or can I substitute with onion powder? Thanks! Adding the cooked burger at the beginning is fine. But not the dairy things. I combined them to say with one pan. But the burger can be at any time. There is one small onion. You could use the equal amount of powder with I think about 2 teaspoons would do it. Fixing the ingredient list in a minute. “Larger Crock pot” doesn’t help. What size did you use, 8 Qt. or 10 Qt? Can I double this recipe? This filled a 6 1/2 qt pot to about 50%. Usually keep a pot at 50-75% max and I like to aim for 60% max. So 6 qt or above. Less full is ok. Absolutely delicious!!!!! I used the handy dandy converter at the bottom of the recipe to make 4 servings! I love not having to figure out all the measurements. Everything was perfect. Easy to prepare. Easy to follow instructions. Great taste! My only variation was to leave the skin on the potatoes. Get a bit more fiber as well as appealing to my lazy self. Will make again! 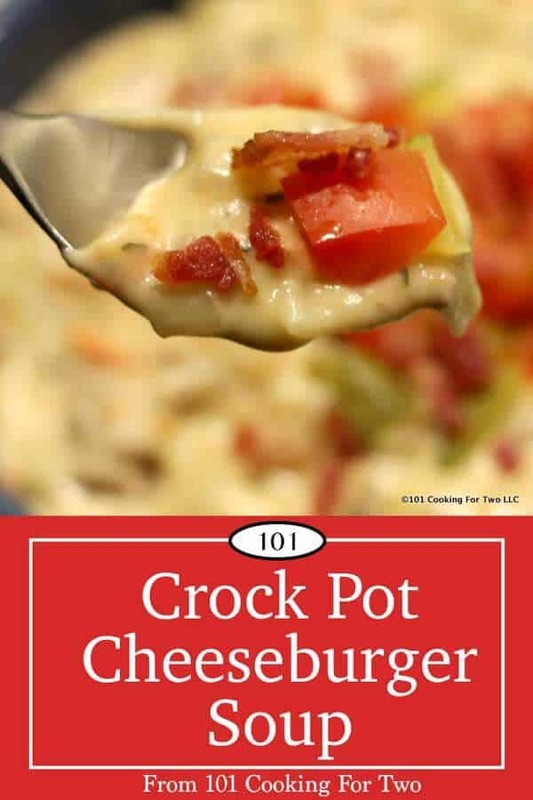 I have been making the Taste of Home version for years, now I will try this crockpot version. 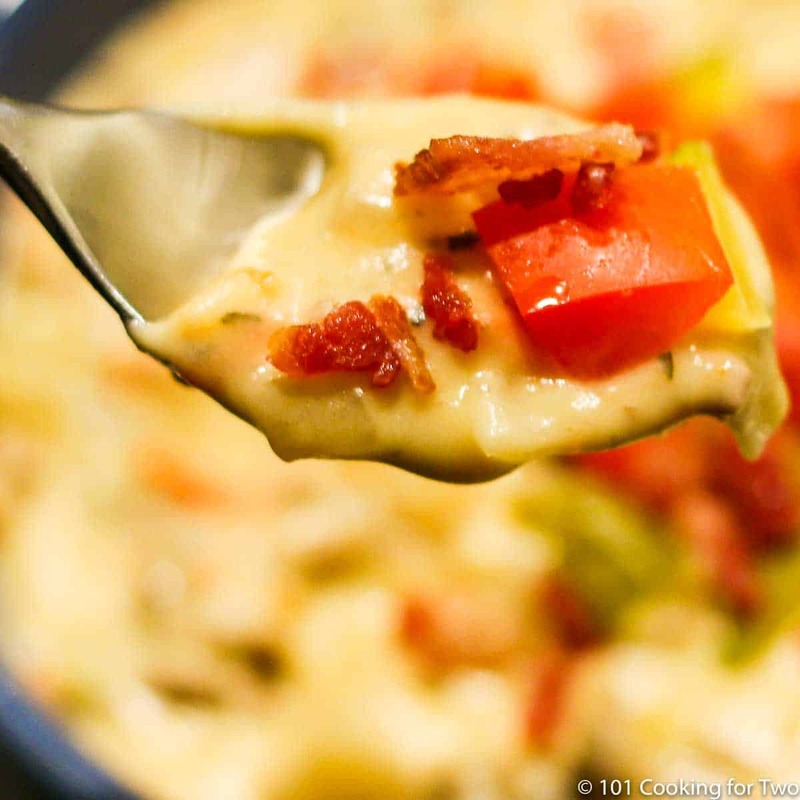 This soup was my intro to Velveeta cheese (i’m European) and everyone told me to avoid it. However after many experiments I have found this is actually the best product for the job. Don’t be put off. Thanks for the note. Since you’re familiar with this recipe, be aware of the changes I made. A bit to there veggies/potatoes but mostly the thickness. If you want approximately what the thickness your have had, go with the cut down butter and flour. If you like it extra thickness that my wife and I wanted, go with the instructions. I think I’m missing something. How much cheese, and when do you add it?